I am a mature age student originally from Lightning Ridge, single mother to three beautiful children. I came to University to do my Bachelor of Nursing to become a registered nurse, after doing my Enrolled Nurse at Walgett Hospital 19 years ago. I completed my HSC in 1995. I had high hopes to become a Doctor, but with a low UAC mark that did not even allow me to gain acceptance into any University. I completed a Certificate IV in Enrolled Nursing at TAFE and was able to apply directly to UNE to start a Nursing degree. I remember my first week of University so clearly. I was so anxious. I was an Indigenous student and mature aged. Was I going to be able to do this? Will my kids cope with me studying? Would I make friends? Am I doing the right thing? ABSOLUTELY! I am doing the right thing. To be honest yes it has been hard but with determination, support through the Oorala Aboriginal Centre has made achieving my dream a reality. The Oorala Centre has kept me going when I doubted my ability or why I even was at Uni. My only advice is if you have a dream and desire let nothing get in your way of achieving it! 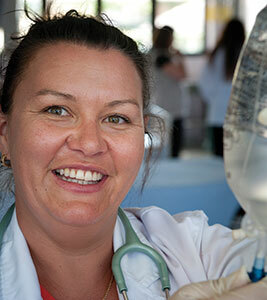 Find out more about studying Nursing at UNE or Contact Oorala to discuss alternative entry pathways.